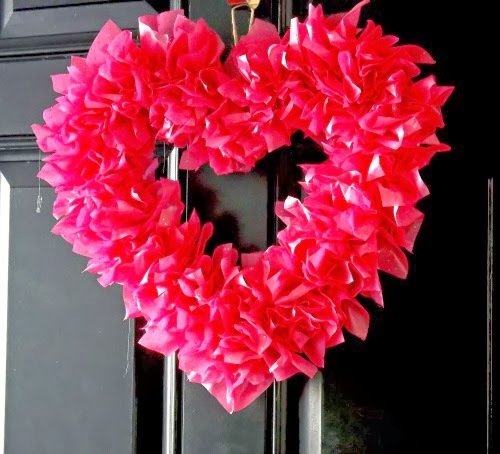 What about a hot pink tissue paper heart on a very black front door..... It definitely stands out....but, I like it. 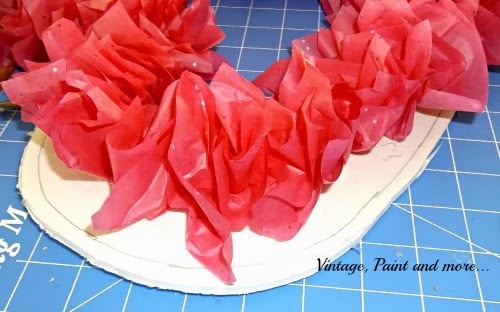 So, today I am going to tell you how to make this really very simple bright heart wreath. 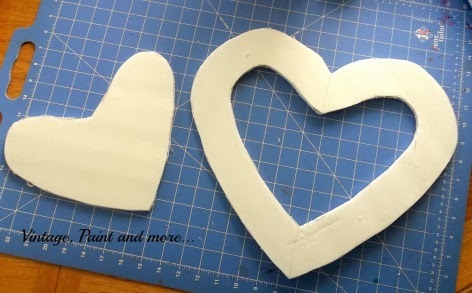 First, I free handed a heart on a piece of paper then cut it out and traced it onto the piece of foam core. I then took a ruler and measured 2 inches in to make another heart inside the one I had just drawn. Here's a picture of the two drawings when I was done. Then I proceeded to cut around both lines with a craft knife. It will look like this when done. Final outside measurements are approximately 15" wide by 14" long. 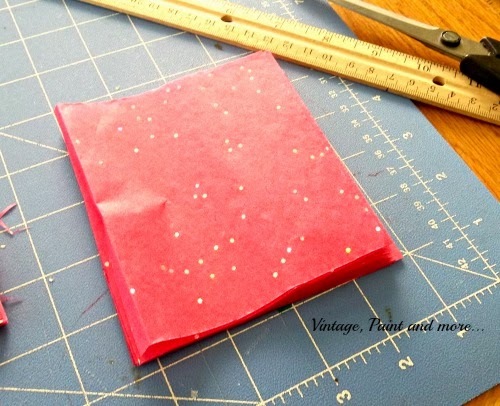 Then cut the tissue paper into squares that are approximately 4" x 5". You will need quite a few - I started with three sheets but when I ran out I just cut more so I lost track of how many I had. You will need to adjust the amount for the size of your heart. Next, tie the 10" length of twine around the heart at the valley at the top. This will be your hanger. 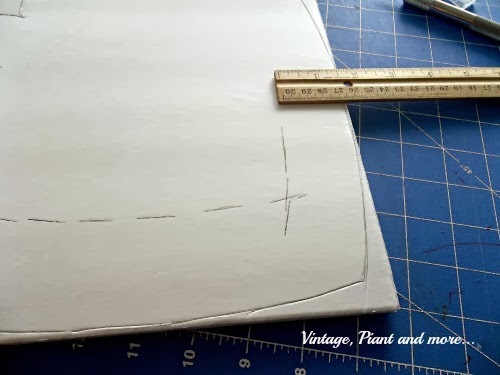 Now you will begin putting the squares of tissue paper on the heart form. I did this by folding one square sheet of paper diagonally from corner to corner. Then I kind of pleated the center and placed a pencil inside. I then put some hot glue on the heart frame and placed the tissue covered pencil on it. You will need to hold it there a few seconds to make sure it sticks. I started on the inside of the heart almost on the edge so no white was showing and worked around the heart and towards the outside at the same time. Another picture of how I filled the inside in and worked towards the outside. Just makes it easier to do. 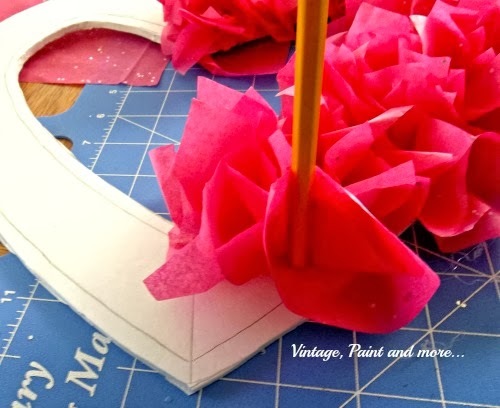 When you have it all filled in you will have a pretty little Valentine Wreath to hang up. Very pretty! I like how the wreath form you made will fit flat against the door. I love love love this! Thank you for the idea! 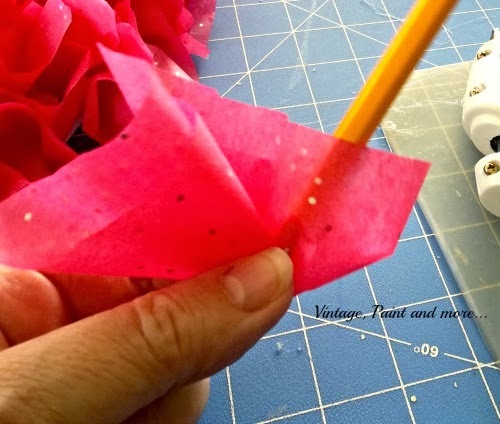 awesome post....I tried this once using dyed coffee filters...didn't work one bit...hehehe...this would be way more do-able! Thanks for the tutorial - so pretty. Visting from Super Saturday Link Party. Oh my, I love this project. 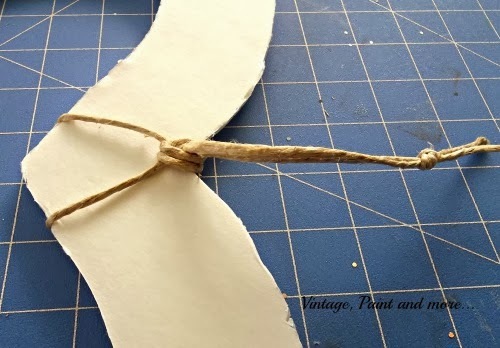 EASY to do and it's so pretty! Love that you created your own template and it has a flat back so it sits on a door or wall perfectly! 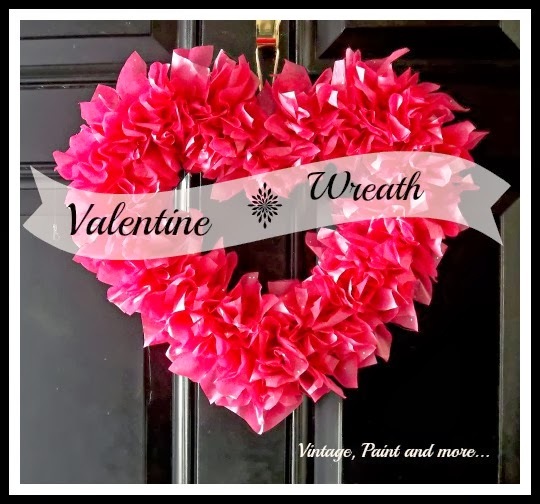 This Valentine Wreath would be the perfect project for my next Moms-Night-In party! Thanks so much for the tutorial! This is lovely! Thanks for sharing at Tell Me About It Tuesday, I hope you hop over this week! Simple and bright - two of my favorite ingredients. This heart just 'pops' on that door of yours. Looks beautiful. Visiting from "TellMeAboutitTuesdays" from over at www.ritewhileucan.com where I gush over all things paper. Cathy, This is super cute! I bought tissue to make something similar. 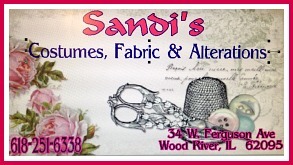 After I had already made a few new things and got my décor out I realized I just may not need it. lol! Was thinking I might make a couple to hang from the porch. I really wouldn't be out much if they got ruined. Thanks for sharing with SYC. 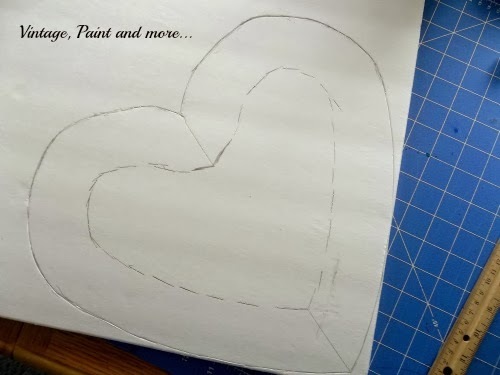 This one is going to be on my list of projects for valentines Perfect! That is so pretty, and seems fairly simply and easy. Thanks for linking it up to Snickerdoodle Sunday. I am co hosting Fluster's Creative muster party! Thanks for linking up!! 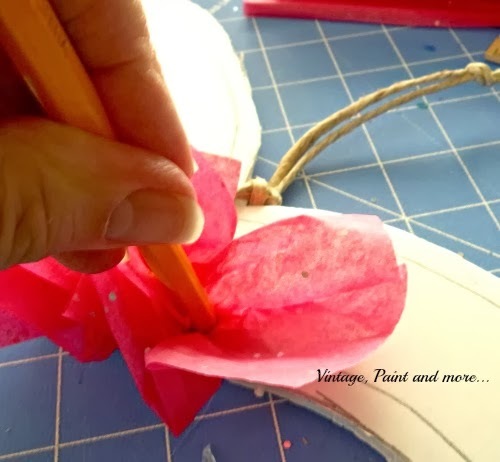 Great tutorial and very cute wreath! I'll be it would be cute with fabric too. Thanks for sharing this at What We Accomplished Wednesdays! Have a super week! What a cute idea! I love doing tissue paper projects. I'm featuring this tonight at my link party and pinning! This is a marvelous tutorial! I am honored that you shared at Home and Garden Thursday! Cute and easy! 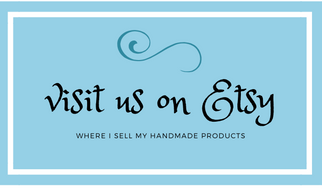 Thanks so much for sharing this on Tell Me About It Tuesday. Looking forward to seeing what you share tomorrow!